Spike timing-dependent plasticity (STDP) is a cellular model of Hebbian synaptic plasticity which is believed to underlie memory formation. In an attempt to establish a STDP paradigm in CA1 of acute hippocampal slices from juvenile rats (P15–20), we found that changes in excitability resulting from different slice preparation protocols correlate with the success of STDP induction. 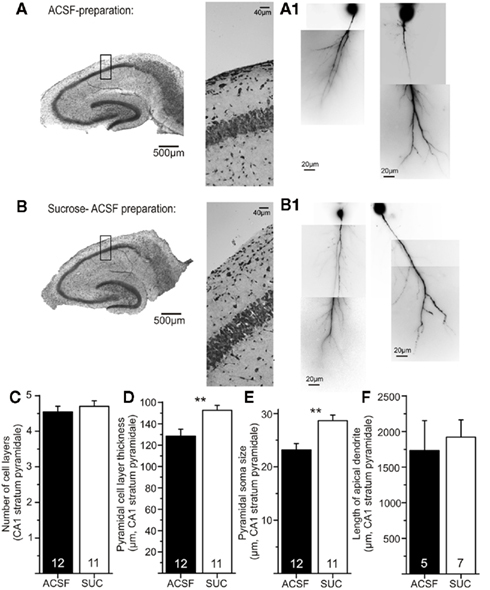 Slice preparation with sucrose containing ACSF prolonged rise time, reduced frequency adaptation, and decreased latency of action potentials in CA1 pyramidal neurons compared to preparation in conventional ASCF, while other basal electrophysiological parameters remained unaffected. Whereas we observed prominent timing-dependent long-term potentiation (t-LTP) to 171 ± 10% of controls in conventional ACSF, STDP was absent in sucrose prepared slices. This sucrose-induced STDP deficit could not be rescued by stronger STDP paradigms, applying either more pre- and/or postsynaptic stimuli, or by a higher stimulation frequency. Importantly, slice preparation with sucrose containing ACSF did not eliminate theta-burst stimulation induced LTP in CA1 in field potential recordings in our rat hippocampal slices. Application of dopamine (for 10–20 min) to sucrose prepared slices completely rescued t-LTP and recovered action potential properties back to levels observed in ACSF prepared slices. Conversely, acute inhibition of D1 receptor signaling impaired t-LTP in ACSF prepared slices. No similar restoring effect for STDP as seen with dopamine was observed in response to the β-adrenergic agonist isoproterenol. ELISA measurements demonstrated a significant reduction of endogenous dopamine levels (to 61.9 ± 6.9% of ACSF values) in sucrose prepared slices. These results suggest that dopamine signaling is involved in regulating the efficiency to elicit STDP in CA1 pyramidal neurons. Long-term potentiation (LTP) and long-term depression (LTD) are considered as neuronal substrates for learning and memory. In comparison to high frequency stimulation or pairing protocols for LTP induction (e.g., Bliss and Lomo, 1973; Kasten et al., 2007), and to low frequency stimulation for LTD (e.g., Lynch et al., 1977), spike timing-dependent plasticity (STDP) is dependent on precise timing of single presynaptic and postsynaptic action potentials rather than on excessive repetitive synaptic activation (reviewed, e.g., in Bi and Poo, 2001; Duguid and Sjostrom, 2006; Caporale and Dan, 2008; Markram et al., 2011). Positive timing (i.e., synaptic activation precedes postsynaptic firing of an action potential) leads to a timing-dependent LTP (t-LTP), while timing-dependent LTD (t-LTD) is typically achieved if a postsynaptic spike precedes the excitatory postsynaptic potential (see, e.g., Markram et al., 1997; Bi and Poo, 1998; Froemke et al., 2005). STDP can be observed in response to physiologically significant levels of synaptic stimulation (Paulsen and Sejnowski, 2000) and has been investigated previously in the hippocampal CA1 region (see, e.g., Magee and Johnston, 1997; Harvey and Svoboda, 2007; Tanaka et al., 2008; Hardie and Spruston, 2009), by employing different STDP paradigms with diverse efficiencies to induce synaptic plasticity. It is well established that repetitive pairing of an EPSP and a single action potential induces STDP in dissociated cultures of hippocampal neurons (e.g., Bi and Poo, 1998; Gerkin et al., 2007), in CA1 pyramidal cells of organotypic slices (Debanne et al., 1994, 1996), or in CA1 of acute hippocampal slices of very young animals (Meredith et al., 2003, P9–14 mice). For older, more mature preparations, the described learning rules in CA1 tend to be contradictory between different studies (compare Buchanan and Mellor, 2010). While Nishiyama et al. (2000) and Campanac and Debanne (2008) reported t-LTP after repetitive pairing of an EPSP with a single action potential in CA1 of acute hippocampal slices from P26–P33 or P15–P20 rats, respectively, neither Pike et al. (1999, young adult rats), Wittenberg and Wang(2006, P14–28 rats), Remy and Spruston(2007, 3- to 5-weeks-old rats), nor Carlisle et al. (2008, 4–12 month old mice) could show t-LTP with single spike pairing conditions in the hippocampal CA1 region. In an attempt to establish a reliable STDP protocol with pairings of single pre- and postsynaptic spikes for CA1 pyramidal neurons in acute hippocampal slices, we analyzed the experimental conditions necessary for successful induction of STDP. Our results reveal efficient induction and high amplitudes of t-LTP when slices were prepared in ACSF solution, whereas preparation of slices in sucrose containing solution strongly reduced the efficiency to induce STDP. Likewise, sucrose preparation of slices reduced, but did not eliminate LTP induced by theta-burst stimulation in field potential recordings. 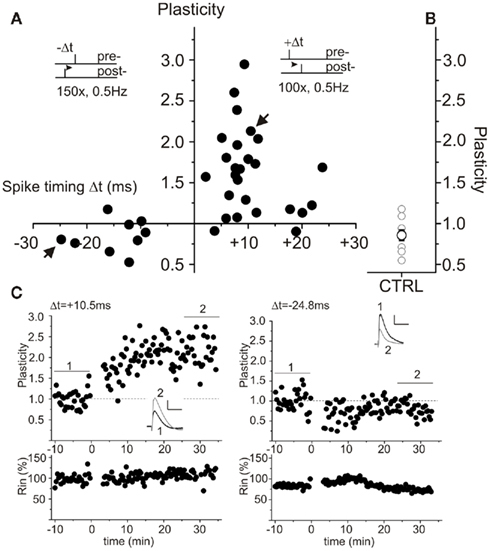 In parallel with reduced synaptic plasticity, spike rise times, latencies, and accommodation properties during repetitive spiking, as well as rise times of single action potentials, elicited by brief high amplitude current injections during STDP induction, were changed significantly in CA1 pyramidal neurons from sucrose prepared slices. Application of exogenous dopamine for 10–20 min rescued t-LTP in sucrose prepared slices, and also restored action potential properties back to values as observed in ACSF prepared slices. Application of isoproterenol, which has been described previously to modulate backpropagating action potentials (Hoffman and Johnston, 1999), changed spike rise times (but not latency or accommodation) similar to dopamine, and it was unable to restore STDP. Interestingly, inhibition of D1 receptors in ACSF prepared slices inhibited t-LTP and also prolonged AP rise times. Furthermore, ELISA measurements revealed a reduction of dopamine levels in sucrose prepared slices. These results suggest that ambient levels of endogenous dopamine in hippocampal slices critically determine the efficiency of STDP induction in CA1. Wistar rats (Charles River, Sulzfeld, Germany; postnatal days 15–23) were killed by decapitations after anesthesia with ketamine/xylazine hydrochloride (i.p. ; 1 ml/kg, Sigma-Aldrich, Germany) and brains were immediately removed. All experiments were performed in accordance with the ethical guidelines for the use of animals in experiments and were approved by the local animal care committee (Landesverwaltungsamt Sachsen-Anhalt). Precaution was taken to minimize stress and the number of animals used in each experimental series. A total number of 88 animals were used in this study. Experiments were performed on transversal hippocampal slices (400 μm thickness) from P15 to P20 Wistar rats (Charles River, Sulzfeld, Germany). For field potential recordings P18–P23 Wistar rats were used. Animals were decapitated after being anesthetized with an intraperitoneal injection of ketamine hydrochloride/xylazine hydrochloride (1 ml/kg, Sigma-Aldrich, Germany). The brain was quickly removed from the skull and placed in one out of three different ice cold preparation solutions [one ACSF-based solution (A); two different sucrose-based solutions (B,C)]. ACSF-based preparation solution A contained (in mM): 125 NaCl, 2.5 KCl, 25 NaHCO3, 10 glucose, 1 CaCl2, 3 MgCl2, saturated with 95% O2 and 5% CO2 (pH 7.4; osmolarity: 292 mosmol/kg). Two slightly different sucrose-based solutions (B and C) were used for slice preparation. Solution B contained (in mM): 20 PIPES, 2.4 KCl, 10 MgSO4, 10 glucose, 195 sucrose, 0.5 CaCl2, bubbled with O2, pH 7.2, osmolarity: 305 mosmol/kg (Munsch and Pape, 1999). Solution C contained (in mM): 20 NaHCO3, 2.4 KCl, 10 MgCl2, 10 glucose, 195 sucrose, 0.5 CaCl2, saturated with 95% O2 and 5% CO2 (pH 7.35, osmolarity: 290 mosmol/kg). Slices prepared in either of the two solutions B and C yielded identical results and data from both groups were pooled. After slicing, the CA1 region was isolated from excessive CA3 input by a single cut between CA3 and CA2 to reduce spontaneous EPSPs and bursting when inhibition was blocked with picrotoxin (Fink and O’Dell, 2009), which is a widely accepted method for hippocampal electrophysiology in CA1 region as well as for STDP experiments. Slices were then transferred to an ACSF solution containing (in mM) 125 NaCl, 2.5 KCl, 25 NaHCO3, 10 glucose, 0.2 CaCl2, 3.8 MgCl2, saturated with 95% O2 and 5% CO2 at 35°C, incubated for 20 min, and were allowed to cool to room temperature at least for 1 h before recording, and were kept in this holding chamber until use (1–7 h). The temperature was reduced to room temperature in order to improve slice viability. Pyramidal neurons in CA1 region of hippocampus were visualized with DIC infrared–video microscopy for patch clamp experiments. For all whole cell recordings 100 μM picrotoxin (PiTX; GABAA receptor antagonist; binds to the GABA receptor-linked Cl− channel) was added to the bath solution containing (in mM) 125 NaCl, 2.5 KCl, 25 NaHCO3, 20 glucose, 2 CaCl2, 1 MgCl2 saturated with 95% O2 and 5% CO2 (pH 7.4, osmolarity: 300 mosmol/kg). Slices were incubated for at least 10 min in the recording chamber before start of recording. Whole cell recordings were performed at 29.4 ± 0.1°C, with pipettes (pipette resistance 6–10 MΩ) filled with internal solution containing (in mM): 115 potassium gluconate, 10 HEPES, 20 KCl, 4 Mg-ATP, 0.3 Na-GTP, 10 Na-phosphocreatine, 0.001 CaCl2; pH was adjusted to 7.4 using KOH (final osmolarity was 280 mosmol/kg). Cells were held in the current clamp mode at −70 mV. To scavenge possible metal ion impurities (including Mg2+ and Ca2+) originating from any substances used for preparation of internal solutions, Chelex 100 resin (BioRad) was added as an ion exchanger to stocks of our internal solutions. In some recordings, the concentrations of Mg2+ (0–2.0 mM), Ca2+ (0–0.001 mM), and EGTA (0–0.5 mM) in the internal solution was altered to investigate possible effects on STDP efficiency. We tested different variants of our internal solution and found that addition of EGTA as well as MgCl2 to the internal solution prevented STDP in ACSF prepared slices (data not shown). Small amounts of CaCl2 (up to 1 μM) in the internal solution improved seal quality without impairment of STDP, and most recordings were thus performed with 0.75 μM added CaCl2 in the pipette solution (see above). In some recordings, ALEXA 488 Fluor (30 μM, Invitrogen, Germany) was added to the internal solution. To assess gross cell morphology, cells of both preparation conditions were dialyzed for at least 15 min with the dye. Fluorescence images were taken at 40-fold magnification using a digital CCD camera (Cool Snap HQ2, Photometrics). Image capture and analysis was performed with MetaVue software (Molecular Devices, Inc.). Total dendritic length of the apical dendrites was measured with the region measurement tool of MetaMorph 7.7 (Molecular Devices, Inc.) in micrometer. For stimulation of Schaffer collaterals, a bipolar concentric stimulation electrode (Frederick Haer & Co., Bowdoin, USA) was placed in stratum radiatum of the CA1 subfield. During control and test periods, EPSPs were evoked at 0.05 Hz. Stimulus intensity was adjusted to evoke 30–50% of maximal EPSP amplitudes (stimulus duration 0.7 ms, intensity 10–400 μA). Cells were accepted for recording only if the resting membrane potential (RMP) was between −50 and −70 mV at the start of the recording. Input resistance of a cell was routinely verified by a 250 ms long hyperpolarizing step in response to a 20 pA current injection. Data were discarded, if input resistance changed more than 30% throughout the recording or in case of a noticeable run-down or run-up of synaptic responses during the first 10 min of a recording. Spike timing-dependent plasticity was induced by repeated pairings of one presynaptically induced EPSP, evoked by stimulation of Schaffer collaterals and (mostly) one postsynaptic action potential induced by somatic current injection (2–3 ms, 1 nA) via the recording electrode. Pairings were repeated 100 times for positive pairing (pre–post pairings, t-LTP) and 150 times for negative pairings (post–pre pairings, t-LTD) at 0.5 Hz (exceptions as indicated). Spike timing intervals (i.e., Δt in ms) were measured between the onset of the EPSP and the peak of the (first) action potential. NMDA-receptor (NMDAR) dependency of the LTP protocol was verified by bath application of 50 μM DL-2-Amino-5-phosphonopentanoic acid (APV, Sigma, data not shown). As a negative control, experiments with ongoing synaptic test stimulation over 45 min at 0.05 Hz, but without pairing with postsynaptic action potentials, were performed. In another set of experiments we used pairings with postsynaptic spike doublets or repetitive pairings (i.e., burst pairing) with different frequencies (compare section Results), to check if these STDP paradigms were more efficient in case of sucrose preparation. Repetitions of pairings with spike doublets were performed at 0.5 and 5 Hz, with 50 or 70 repetitions. Spike timing was determined between the onset of the EPSP and the peak of the first action potential. The burst STDP paradigm consisted of five successive presynaptic stimulations combined with five postsynaptic depolarizations by somatic current injections, at 10 Hz. Train stimulation was repeated 15–30 times at 0.2 Hz. The spike timing interval was determined between the onset of the first EPSP and the peak of the first action potential under these conditions. This paradigm was adapted with slight modifications from existing protocols (Magee and Johnston, 1997; Golding et al., 2002). Field potential measurements were also performed in CA1 region of acute hippocampal slices of Wistar rats (P18–P23) prepared with sucrose or sucrose-free ACSF slice preparation media (see above). Experiments were performed at least 1 h after preparation in a temperature controlled (30°C) interface chamber. Schaffer collaterals were activated by the same concentric bipolar stimulation electrode (Frederick Haer & Co, Bowdoin USA) positioned in the stratum radiatum of CA3 or CA1 region, as used in STDP recordings. Field potentials (fEPSP) were measured with a glass electrode filled with ACSF (6–10 MΩ). Stimulus intensity was set to 30–50% of maximum synaptic responses. For LTP experiments, test stimuli were applied every 60 s. Baseline was recorded for at least 10 min. Theta-burst stimulation [10 bursts of 4 stimuli (at 100 Hz) every 200 ms] was given at test stimulus intensity and repeated twice at 20 s interval. In all patch clamp and field potential recordings, bath perfusion was set to 2–3 ml/min. All drugs were bath applied. PiTX, ISO, DA, VitC, and APV were purchased from Sigma. Chelex 100 resin was purchased from BioRad. Vit C (40 μM) was added as antioxidant to all DA containing solutions. Whole cell recordings were obtained using either an EPC8 patch clamp amplifier connected to a LiH8 + 8 interface or an EPC10 amplifier (HEKA, Germany), and acquired with Patchmaster software (HEKA, Germany). Data were filtered at 3 kHz and digitized at 10 kHz. Data analysis was performed using Fitmaster (HEKA, Germany) and Minianalysis software (Synaptosoft, USA). For most cells, synaptic signals were recorded in the current clamp mode as EPSPs. In some experiments, postsynaptic neurons were held in the voltage clamp mode (except for pairing) and synaptic EPSCs were recorded, without any obvious changes in STDP efficiency. EPSP slopes were calculated from the initial 2 ms after EPSP onset, EPSP amplitudes were determined between EPSP peak values and baseline values. In all cases, changes in amplitude and slope of synaptic signals were observed in parallel. All data were normalized to baseline conditions, and baseline was set to 1 (average over 5–10 min). Plasticity, as an indicator for synaptic change, was calculated as the normalized change in response size averaged between 20 and 30 min, after t-LTP or t-LTD induction. Rise times of EPSPs were determined by the 10–90% criterion of the Fitmaster software (HEKA, Germany). Action potential analysis was performed with the spike detection algorithm of the Minianalysis program (Synaptosoft, USA). Field potentials were measured with an Ext-02F/2 amplifier (npi, Germany) and recorded with a CED 1401 interface. Data were filtered at 10 kHz. Field EPSP slope was calculated with the program Intracell 1.5 (IFN Magdeburg, Germany) between fEPSP onset and maximal amplitude. Field EPSP slopes were normalized to mean baseline (between 0 and 10 min), which was set to 100%. LTP was determined as the normalized change in average response size during the last 5 min of recording (25–30 min after LTP induction) compared to baseline. Measurements without stable potentiation (early LTP ≤ 15% compared to baseline) or showing only posttetanic potentiation were discarded. Slices were prepared as described for electrophysiological recordings. After incubation in recording solution for at least 1 h, slices were fixed in 4% paraformaldehyde overnight. Cryosections (20 μm thickness) of both preparation conditions were mounted on glass slides and stained with cresyl violet according to standard procedures. Cell number, layer thickness and cell diameter in CA1 region of the hippocampus were analyzed using an object micrometer. Photomicrographs were taken at 20× magnification with a CCD camera (SPOT insight fire wire 2, Diagnostic Instruments, Inc., USA) using SPOT Basic 4.6 software (Diagnostic Instruments, Inc., USA.). Hippocampal slices were prepared as described for electrophysiological recordings, and quantitative determination of dopamine in sucrose and sucrose-free prepared slices was carried out using a commercially available ELISA kit (IBL International, Germany). The procedure consisted of two phases – extraction and quantification – executed following the manufacturer’s instruction. Extinction of probes was analyzed with a TECAN infinite F200 ELISA reader (Tecan Group Ltd., Switzerland). Data are expressed as dopamine (DA) in pg/mg tissue. Pooled data are given as mean ± SEM. Statistical analysis was performed by paired or unpaired two-tailed Student’s t-test, as appropriate. Non-parametric data were analyzed by Mann–Whitney U-test or Wilcoxon-test, respectively. Multiple comparisons were performed with ANOVA and post hoc Tukey test. Significance levels are indicated by *p < 0.05, **p < 0.01, ***p < 0.0001. Whole cell patch clamp recording of CA1 pyramidal neurons was employed to establish a STDP paradigm consisting of repeated presynaptically elicited single EPSPs paired with single postsynaptic action potentials in hippocampus from juvenile rats (P15–P20). Hippocampal slices were obtained under two different preparation conditions. Slices were prepared either in conventional ACSF, or in sucrose containing ACSF to improve cell viability as reported previously (Aghajanian and Rasmussen, 1989; Urban et al., 1998). To circumvent possible LTP deficits due to sucrose preparation induced changes in GABAergic transmission (compare Kuenzi et al., 2000) and to investigate STDP mechanisms in the absence of GABAA receptor mediated inhibition, picrotoxin (100 μM) was added to all extracellular recording solutions. In both groups the CA3 region was surgically disconnected by a cut from CA1, to avoid epileptiform activity during measurement (compare Fink and O’Dell, 2009). Recordings were obtained under visual inspection from CA1 pyramidal neurons in either sucrose or ACSF prepared slices. Positive pairings (Δt = +2 to +25 ms) and negative pairings (Δt = −9 to −25 ms) revealed successful STDP only in CA1 neurons of ACSF prepared slices (Figure 1). In contrast, slices prepared in sucrose containing ACSF did not show the characteristic STDP learning rules seen with conventional ACSF (Figure 2). Single experiments are shown for ACSF prepared slices for positive and negative pairings (Figure 1C) as well as for sucrose prepared slices (Figure 2C). For quantification of net effects of STDP, neurons of both groups were binned in 15 ms intervals (Figure 2D). Significant timing-dependent potentiation (t-LTP) for short positive pairings could only be achieved in case of ACSF preparation [Figure 2D, ANOVA F(6,82) = 13.04; p < 0.0001, post hoc Tukey test: *p < 0.05: Δt = +15 ms vs. Δt = +30 ms, ***p < 0.0001: Δt = +15 ms vs. CTRL and Δt = −15 ms, respectively], while sucrose prepared slices failed to reveal a clear learning rule with the STDP paradigms used in our study (Figure 2D: p > 0.05). Accordingly, t-LTP was significantly enhanced in ACSF compared to sucrose prepared slices [ANOVA F(6,82) = 13.04; p < 0.0001, post hoc Tukey test: ***p < 0.001: Δt = +15 ms: t-LTPACSF: 1.71 ± 0.1 (n = 20) vs. t-LTPSucrose: 0.87 ± 0.8 (n = 23) and Δt = +30 ms: t-LTPACSF: 1.22 ± 0.1 (n = 5) vs. t-LTPSucrose: 0.76 ± 0.1 (n = 12), respectively]. The t-LTP induced by our STDP protocol was blocked completely in the presence of the NMDA-receptor antagonist APV [50 μM; Δt = +15 ms: 1.15 ± 0.1 (n = 7); p < 0.01 compared to t-LTPACSF; two-tailed Student’s t-test]. Figure 1. Spike timing-dependent plasticity (STDP) in ACSF prepared rat hippocampal slices. Synaptic responses were recorded in the current clamp mode in CA1 pyramidal neurons of juvenile rats (P15–P20). Pre-stimulus membrane potential prior to recording was −70 mV for all cells. Presynaptic stimulation of Schaffer collaterals was performed every 20 s. (A) Single spike pairings at short positive (Δt = +2 to +25 ms) intervals lead to t-LTP. Negative (Δt = −8 to −25 ms) pairings result in t-LTD. Insets show the employed pairing paradigms. (B) Summarized control measurements (n = 9, mean ± SEM) without spike pairing in ACSF prepared slices. (C) Examples of single experiments for positive pairing (left) and negative pairing (right). The corresponding cells are indicated with arrows in (A). Respective averaged original traces are shown as insets, analysis of input resistance is shown in the lower graphs. Bar scales: 1 mV, 50 ms. Figure 2. Spike timing-dependent plasticity (STDP) after sucrose preparation of rat hippocampal slices reveals STDP deficiency. Experimental conditions as in Figure 1, but slices were prepared in sucrose media. (A) Neither positive nor negative pairings led to convincing levels of STDP (compare Figure 1). STDP paradigms with single EPSP/AP pairings are indicated by insets. (B) Level of plasticity in control experiments in sucrose prepared slices without spike pairing (open circle: n = 7, mean ± SEM). (C) Example of an experiment with positive pairing in a sucrose prepared slice. Averaged original traces are shown in the inset, recording of input resistance is shown in the lower graph. The corresponding cell is marked with an arrow in (A). Bar scale: 1 mV, 50 ms. (D) Summary of STDP results in ACSF (black) and sucrose (white) prepared hippocampal slices at different spike timings (in ms, 15 ms binning). Data are given as mean ± SEM; statistics were performed by ANOVA *p < 0.05; ***p < 0.0001. In experiments with ACSF prepared slices, we occasionally also obtained t-LTD at short negative pairings (1 EPSP/1 AP protocol). However, the mean t-LTD observed in these cells, was smaller than in sucrose prepared slices [Figure 2D: Δt = −15 ms: LTDACSF: 0.84 ± 0.1 (n = 5) vs. t-LTDSucrose: 0.56 ± 0.1 (n = 4) and Δt = −30 ms: t-LTDACSF: 0.85 ± 0.1 (n = 4) vs. t-LTDSucrose: 0.54 ± 0.0 (n = 1)], and was not significantly different from un-potentiated ACSF controls. Since, we focused on positive pairings and LTP in the present study, conditions for t-LTD were not further investigated. To be able to check for spontaneous changes in plasticity in our recordings, we performed control experiments (i.e., without STDP stimulation) in both experimental groups. 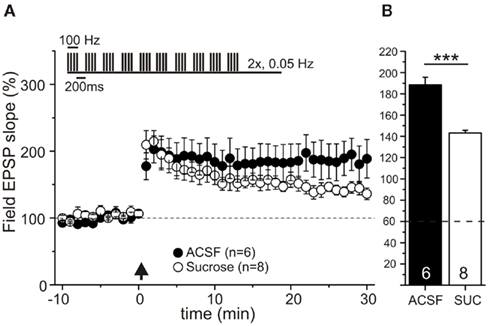 As shown in Figures 1 and 2, these controls did not show significant changes in EPSP slopes after 45 min of recording, and EPSP slopes were not significantly different between cells in sucrose and ACSF prepared control slices, respectively [Figure 2D: ACSF: 0.85 ± 0.1 (n = 9) vs. sucrose: 0.79 ± 0.1 (n = 7), p > 0.05]. Importantly, these results indicate no spontaneous difference in synaptic efficacy (like, e.g., run-down) between the two groups. In order to test for a potential influence of the different preparation solutions on LTP efficiency, we also measured LTP with field potential recordings in P18–P23 rats (Figure 3). LTP was induced by two theta-burst stimulations (TBS) and was measured in the absence of picrotoxin, and thus with intact synaptic inhibition. Omitting picrotoxin was necessary, because otherwise epileptiform discharges were observed (data not shown). While short-term potentiation (STP, first 20 min after TBS) was indistinguishable between both groups, e-LTP was significantly increased in ACSF prepared slices compared to slices after sucrose preparation (Figures 3A,B: LTP at 30 min after TBS in ACSF prepared slices: 188.6 ± 7.0 compared to 143.2 ± 2.4% in sucrose prepared slices, p < 0.0001, Mann–Whitney U-test). However, also in sucrose prepared slices stable e-LTP was clearly detected. Successful e-LTP could be evoked in n = 8 slices from 3 animals (altogether 11 trials) after sucrose preparation and in n = 6 slices from 3 animals (altogether 9 trials) after preparation in conventional ACSF. Figure 3. e-LTP is reduced, but not abolished in sucrose prepared hippocampal slices. Field potential recordings in CA1 region of acute hippocampal slices of P18–23 Wistar rats. Slices were prepared in sucrose containing ACSF (open circles, n = 8 slices of 3 animals, from 11 experiments) or in conventional ACSF (black dots, n = 6 slices of 3 animals, from 9 experiments). After recording of 10 min baseline, e-LTP was induced by two theta-burst stimulations [interval 20 s, TBS protocol is shown as inset, time point of TBS stimulation: arrow (A)]. While short-term plasticity (≤20 min) is similar for both groups, e-LTP (at 30 min) is significantly stronger in ACSF prepared slices compared to sucrose preparation (B). Data are normalized to baseline (average over 10 min prior to theta-burst; set as 100%) and given in mean ± SEM, ***p < 0.0001, Mann–Whitney U-test. Overall these data suggest a preparation dependent impairment of LTP maintenance, or of conversion of STP to LTP in sucrose prepared slices, which might result from depletion of LTP-maintaining/inducing factors like, e.g., dopamine under these conditions (compare Otmakhova and Lisman, 1996). Differences in the efficacy of t-LTP in response to single spike pairings could result from differences in basal properties of recorded pyramidal cells in slices prepared under different conditions. To test this, we compared basal electrophysiological properties of the cells in the different experimental groups. The measured RMPs were significantly different between ACSF- and the sucrose group (ACSF: −63.9 ± 1.4 mV vs. Sucrose: −58.7 ± 1.1 mV, p < 0.01, two-tailed Student’s t-test). Nevertheless, RMPs of all groups fall within the normal range described for CA1 pyramidal neurons in the hippocampus (Spigelman et al., 1992; Spruston and Johnston, 1992; Staff et al., 2000). All other measured electrophysiological parameters (like input resistance, mean EPSP amplitude, EPSP rise time and EPSP half width) were not significantly different between the two groups (see Table 1: ACSF vs. Sucrose). Importantly, membrane potential was set to −70 mV for all cells during STDP recording, ruling out an effect of changed RMP on induction of synaptic plasticity. Table 1. Basal electrophysiological parameters of neurons in ACSF or sucrose prepared slices, and after dopamine or isoproterenol treatment of sucrose prepared slices. Slice preparation in sucrose solution could affect several fellow properties, not investigated explicitly by our electrophysiological measurements (compare basal and active cell properties, Tables 1 and 2; Figure 5), thus leading to an increase in the STDP induction threshold. In an attempt to compensate for such possible deficits in sucrose prepared slices, we tried to rescue STDP by repetitive (burst) pairings or doublet pairings with either higher or lower pairing frequency. 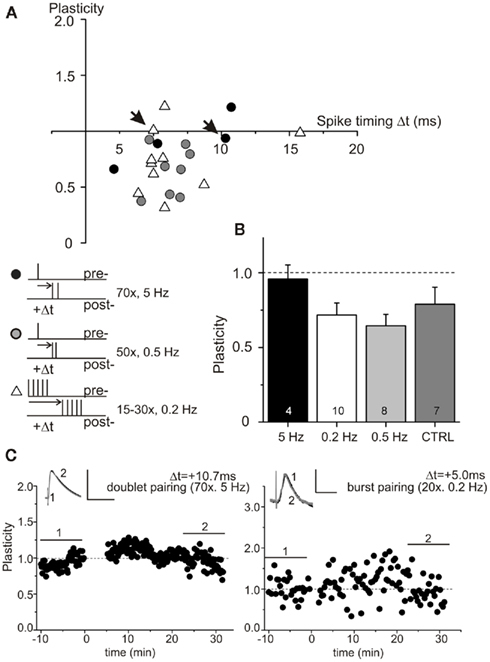 However, pairing of one presynaptically induced EPSP with two postsynaptic spikes (compare Wittenberg and Wang, 2006) with an interspike interval of 10 ms at 5 Hz and 3 ms at 0.5 Hz, did not improve the efficiency of STDP at short positive pairings (Figure 4, black circles: pairings at 5 Hz; gray circles: pairings at 0.5 Hz). Likewise, applying stronger STDP induction protocols (Golding et al., 2002; modified after Magee and Johnston, 1997), using repetitive (burst) pairings of 5 successive EPSPs with 5 successive action potentials repeated 15–30 times at 0.2 Hz did also not rescue t-LTP (Figure 4, open triangles). Plasticity values were not significantly different from unstimulated controls for these conditions (Figure 4B, p > 0.05). Respective single experiments are shown in Figure 4C. These data indicate that stronger protocols and/or higher pairing frequency cannot compensate for the deficit in STDP in the sucrose group. Figure 4. Spike timing-dependent plasticity deficiency is not restored by stronger STDP inducing paradigms. Experimental conditions as in Figure 1. 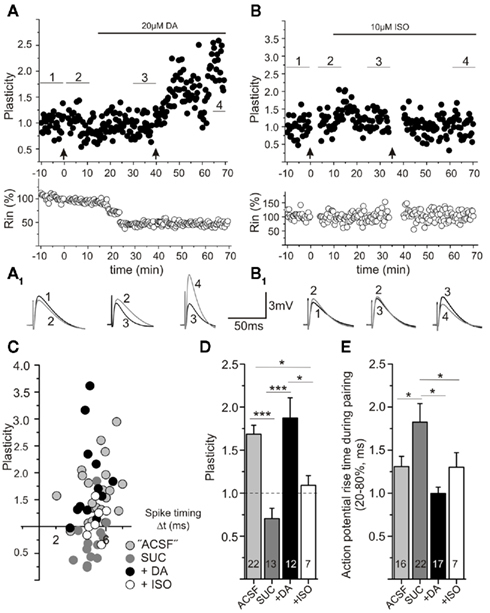 STDP could not be rescued in sucrose prepared hippocampal slices, when using 50 or 70 pairings of one presynaptically evoked EPSP and two postsynaptic spikes with 3 ms interspike interval paired at 0.5 Hz (gray dots), or with 10 ms interspike interval paired at 5 Hz (black dots), or when using 15–30 burst stimulations consisting of 5 successive EPSPs paired with 5 evoked action potentials at 0.2 Hz (open triangles), respectively (A). Respective data for the different paradigms are summarized in (B). Results from individual experiments are shown in (C) for doublet pairing (left), and repetitive burst pairings (right). The corresponding cells are indicated with arrows in (A). Bar scales: 10 mV, 50 ms (left), 5 mV, 50 ms (right). Figure 5. Action potential frequency and rise times are influenced by sucrose preparation. CA1 pyramidal neurons were recorded in the current clamp mode and action potentials were induced by current injection. Membrane potential was −70 mV prior to stimulation. (A) Sucrose preparation led to a significant increase in action potential frequency compared to preparation in ACSF (p < 0.05, ANOVA). Typical original traces are shown for both conditions (1 s depolarization at 120 pA). (B) Representative original traces for rise time and latency differences are shown for a 120 pA current injection for neurons of sucrose and ACSF prepared slices. Spike adaptation (C) at the beginning of the spike train and (D) at the end of the spike train was diminished in sucrose prepared hippocampal slices (**p < 0.01, 120 pA depolarization). (E) Action potential rise time (10–90% of peak amplitude) was significantly prolonged after sucrose preparation compared to ACSF (**p < 0.01, 120 pA constant current injection). (F) Changed latency to first action potential (in ms) in response to 120 pA current injection in sucrose and ASCF group of slice preparation (**p < 0.01, Mann–Whitney U-test). Table 2. Comparison of action potential parameters (compare Figures 5 and 7) in ACSF and sucrose prepared hippocampal slices, and after dopamine or isoproterenol treatment of sucrose prepared slices. The efficiency to induce STDP, which is critically dependent on the fidelity of action potential firing, is likely to be altered by changes in the intrinsic excitability of neurons. We therefore determined firing frequency and action potential time course/shape in neurons of the two groups of slice preparation techniques (Figure 5). Action potential frequency in response to constant 1000 ms long current injection was significantly enhanced by sucrose preparation [Figures 5A,B; ANOVA F(1,29) = 6.42; p < 0.05, post hoc Tukey test p < 0.05 for a depolarization stronger than 60 pA]. Accordingly, first and last interspike intervals were significantly shortened (Figures 5C,D). However, these differences in repetitive firing cannot be directly related to the absence of t-LTP in the sucrose group, since only single postsynaptic APs were elicited with our standard STDP paradigm. Interestingly, action potential rise time (10–90%) was prolonged roughly threefold in the sucrose group [see Figure 5E; sucrose: 1.16 ± 0.2 ms (n = 22) vs. ACSF: 0.4 ± 0.0 ms (n = 9), p < 0.01 Student’s t-test], and latency of firing after the onset of somatic depolarization, as indicated by latency of first AP, was significantly shortened in sucrose [Figure 5F; sucrose: 31.4 ± 5.3 (n = 22) vs. ACSF: 51.9 ± 7.2 (n = 9); Mann–Whitney U-test, p < 0.01]. These changes in rise time and latency pointed to a possible role of the action potential time course in modulating the efficiency of STDP. In contrast, other parameters like action potential threshold, amplitude, area, half width and decay time, respectively, were not significantly different between ACSF and sucrose preparation conditions (compare Table 2). A similar prolongation of action potential rise times after sucrose preparation was observed for somatically induced action potentials during STDP induction, which were elicited by brief high amplitude current injections (Figure 6E; 1 nA current injection, 2–3 ms; ACSFrise time: 1.31 ± 0.1 ms vs. sucroserise time: 1.82 ± 0.2, p < 0.05). Figure 6. Spike timing-dependent plasticity can be restored by acute application of dopamine, but not isoproterenol, in sucrose prepared slices. Experimental conditions as described in Figure 1. (A) Example of a cell prepared in sucrose, in which STDP induction with short positive pairings was initially unsuccessful (first trial of STDP induction at 0 min, see arrow), but was restored after application of dopamine (DA, horizontal bar indicates time of DA application), followed by a subsequent second trial of STDP induction (at 40 min, arrow). Averaged original traces (10 min mean, numbers refer to averaging intervals as indicated in (A) during the experiments are shown in (A1). While DA alone has no effect on plasticity, it enables t-LTP. (B) The β-adrenergic agonist isoproterenol (ISO, horizontal bar indicates time of ISO application) does not restore STDP in sucrose prepared slices. Respective averaged traces (10 min mean, numbers refer to averaging intervals as indicated in (B) are shown in (B1). (C) Data for STDP experiments in sucrose prepared slices performed either in the absence of DA (gray), in the presence of 20 μM DA (black), or with 10 μM ISO (open circles) show that DA can restore STDP (drugs were preincubated for 20 min) to levels observed in ACSF prepared slices (light gray symbols). These data are summarized in (D). DA significantly enhances potentiation at short positive pairings, while isoproterenol is not effective to restore STDP (*p < 0.05, **p < 0.01, ANOVA). (E) The rise time of action potentials during STDP induction is significantly longer in sucrose prepared slices and is shortened by either application of DA or ISO (*p < 0.05, ANOVA). Taken together, the observed differences in spike rise time and latency to first action potential between the two groups showed a strong correlation with the success rate for induction of t-LTP. Neuromodulators like dopamine, noradrenaline, and nicotine have been implicated recently in modulating the success of STDP protocols in brain slices from striatum and visual cortex, respectively (Seol et al., 2007; Pawlak and Kerr, 2008; Shen et al., 2008). Dopaminergic innervation from midbrain A9 and A10 cell groups and noradrenergic innervation from locus coeruleus were described for the hippocampal CA1 region (e.g., Swanson-Park et al., 1999; Scheiderer et al., 2008). Both neuromodulators are also involved in hippocampal learning (e.g., Yang et al., 2002). To investigate whether the deficit in STDP after sucrose preparation depends on dopamine and/or noradrenaline signaling in our slices, we tried to rescue STDP either by adding dopamine (20 μM) or 10 μM isoproterenol (β-adrenergic agonist) to the extracellular recording solution. Interestingly, the same sucrose prepared slices not showing t-LTP in response to our STDP protocol, revealed t-LTP when the STDP protocol was repeated after 20 min of dopamine application (Figures 6A,C). Dopamine application in the absence of STDP stimulation failed to show a consistent change in EPSP amplitudes (data not shown), but all cells now yielded functional t-LTP when the STDP protocol was applied (Figures 6C,D). When including dopamine (20 μM; incubation ≥ 10 min) in the standard extracellular recording solution, positive pairings in sucrose prepared slices routinely showed t-LTP, which was indistinguishable from t-LTP in ACSF prepared slices (compare Figure 2D and Figures 6A,C; t-LTP in ACSF prepared slices: 1.71 ± 0.1 compared to 1.87 ± 0.2 in dopamine treated sucrose prepared slices, p > 0.05, Student’s t-test). In contrast, pretreatment with isoproterenol (10 μM; incubation ≥ 10 min) did not appear to restore the deficit in t-LTP at short positive spike timings after sucrose preparation (Figures 6B,C). In individual cells, t-LTP could be observed, but the average plasticity was significantly different from t-LTP in ACSF and sucrose + DA slices [Figure 6D: ANOVA F(3,48) = 14.88; p < 0.0001, post hoc Tukey test: ***p < 0.0001: t-LTPACSF or SUC + DA: 1.68 ± 0.1 (n = 22) or 1.87 ± 0.2 (n = 12) vs. t-LTPSucrose: 0.70 ± 0.2 (n = 13) and *p < 0.05: vs. t-LTPSUC + ISO: 1.13 ± 0.2 (n = 7), respectively]. These results show that the t-LTP deficit after sucrose preparation can be counteracted completely by brief incubation (i.e., 10–20 min) of slices with dopamine, but not by application of isoproterenol. Acting via D1 and D2 receptors dopamine is known to exert a multitude of effects on K+, Ca2+, and Na+ channels (see, e.g., Neve et al., 2004), respectively, which corroborate in regulating firing properties of neurons. Similar modulatory effects have been described for agonists of the adrenergic system (like, e.g., isoproterenol; compare, e.g., Segal, 1982; Hillman et al., 2005). In the light of the importance of spike fidelity for induction of STDP, and given the modified spiking of sucrose prepared neurons in addition to failure of induction of STDP, we checked whether treatment with dopamine or isoproterenol would also change the spiking properties back to ACSF conditions. As shown in Figure 7, this was indeed the case for dopamine: 6–20 min incubation of neurons with 20 μM dopamine increased spike accommodation [Figure 7A, ANOVA F(3,50) = 4.652; p < 0.01, post hoc Tukey test p < 0.01 for a depolarization stronger than 80 pA], spike intervals (Figures 7C,D, p < 0.05), and latency of AP firing (Figure 7F, p < 0.05), and decreased spike rise times (Figure 7E, p < 0.05, all statistical analyses were performed by ANOVA with post hoc Tukey test), back to values observed in ACSF. Figure 7. Acute application of dopamine, but not isoproterenol, completely restores firing pattern in sucrose prepared slices. Experimental conditions as in Figure 5. APs were recorded in current clamp in the absence/presence of dopamine (DA) or isoproterenol (ISO). (A) After 6–10 min application of DA (20 μM), or 10 μM ISO the AP frequency of neurons in sucrose prepared slices was either completely (DA) or partially (ISO) decreased, back to levels observed in ACSF prepared slices (*p < 0.05). Typical original traces are shown as insets. (B) Representative original traces for rise times and latency changes in response to 120 pA current injection. First and last interspike intervals were prolonged after acute application of DA (but not ISO) to a comparable level as observed in ACSF prepared slices [(C,D), *p < 0.05]. The prolonged rise times typical for neurons after sucrose preparation were reduced by acute application of DA or ISO [(E), **p < 0.01]. (F) The first AP was generated significantly later after application of DA compared to sucrose preparation. ISO had no effect on spike latency. All measurements were performed with APs induced by 120 pA current injection (*p < 0.05, multiple comparisons were performed by ANOVA). In contrast to dopamine, application of isoproterenol only partially restored AP parameters back to ACSF levels (Figure 7). While the AP rise time was shortened by application of isoproterenol (compare Figure 6E and Figure 7E), other AP parameters were not/not fully restored back to ACSF conditions (Figures 7A,C,D,F, further parameters see Table 2). The distinct effects of dopamine and isoproterenol on these spike properties cannot be explained by changes of basal electrophysiological properties, because they were not significantly different between the two groups (see Table 1). 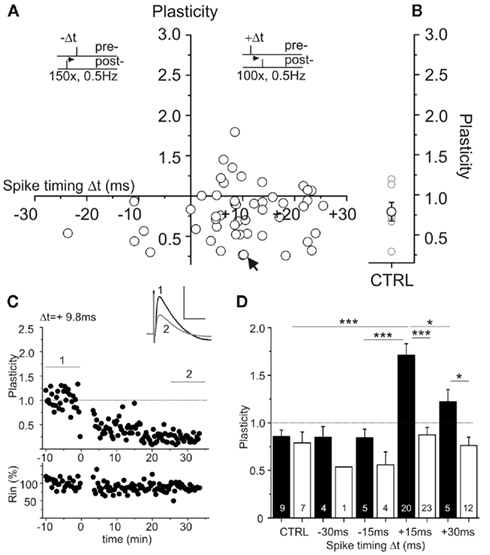 These experiments reveal that dopamine regulates – on the same time scale – the efficiency of STDP protocols and the fidelity of action potential firing in CA1 pyramidal neurons. In contrast, isoproterenol only restored those AP parameters which do not seem to correlate with rescue of STDP in sucrose prepared slices. When dopamine (20 μM) was applied to ACSF prepared slices, t-LTP was not affected. Thus, plasticity was not altered compared to untreated controls, but was significantly different from negative controls (compare Figure 8). Interestingly, when ACSF prepared slices were preincubated (20 min) with the D1 receptor antagonists SCH23390, our induction protocol which usually yielded t-LTP, was then ineffective [Figures 8C,D, ANOVA Test F(3,28) = 10.43; p < 0.0001, post hoc Tukey comparison *p < 0.05: DA (t-LTP: 1.48 ± 0.2) vs. CTRL (unstimulated: 0.97 ± 0.1) and DA vs. SCH23390 (t-LTP: 0.6 ± 0.2); ***p < 0.0001: ACSF (t-LTP: 1.74 ± 0.1) vs. CTRL and ACSF vs. SCH23390]. On the same time scale, SCH23390 also converted action potentials to a slower rise time mode [rise time (10–90%) in ACSF: 0.34 ± 0.01 ms compared to SCH23390: 0.39 ± 0.02 ms, p < 0.05, paired Student’s t-test]. The action potential frequency and RMP remained unchanged under SCH23390 (data not shown). 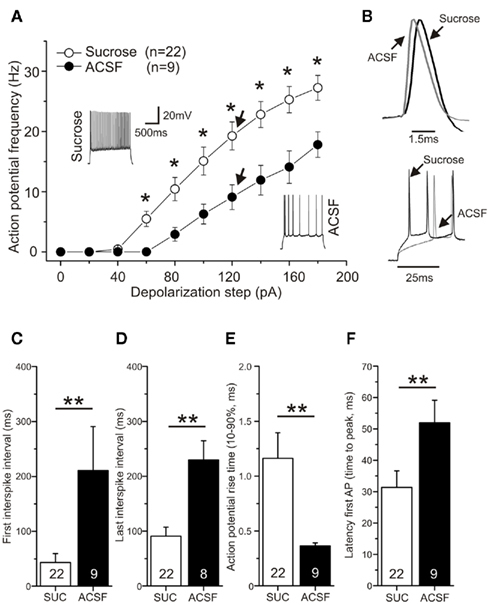 These results suggest that ambient levels of endogenous dopamine in ACSF prepared slices, acting via D1 dopamine receptors, keep action potential properties in shape and yield efficient t-LTP. Adding surplus dopamine, however, does not seem to further improve conditions for STDP induction. Figure 8. Spike timing-dependent plasticity (STDP) in ACSF prepared slices is dependent on endogenous dopamine. Experimental conditions as in Figure 6. (A) Experiment showing unaltered STDP in an ACSF prepared slice after acute application of exogenous DA (20 μM, see horizontal bar). (B) Averaged original traces [*suprathreshold EPSP is truncated; numbers refer to averaging intervals as indicated in (A)]. (C) Data for STDP experiments in ACSF prepared slices performed either in normal ACSF (gray circles), in 20 μM DA (black circles), or in the presence of the D1 antagonist SCH23390 (10 μM; open circles). (D) Averaged data for experiments shown in (C). Note that application of exogenous DA has no effect on intact STDP in ACSF prepared slices (with sufficient ambient DA), but that inhibiting D1 signaling by SCH23390 (SCH) significantly blocked potentiation at short positive pairings (white bar), CTRL = Control measurement without drug and pairing protocol (dark gray bar). *p < 0.05 or ***p < 0.001 ANOVA with post hoc Tukey test. To directly check dopamine levels we performed dopamine ELISA measurements in sucrose and ACSF prepared slices. Consistent with the above mentioned results, dopamine levels in sucrose treated slices were significantly lower compared to ACSF prepared samples [DA-reduction to 61.9 ± 6.9% in sucrose prepared slices compared to ACSF prepared slices, **p < 0.01 t-test (n = 5 preparations/group); 47.9 ± 23.4 pg/mg tissue in sucrose vs. 78.8 ± 18.4 pg/mg tissue in ACSF prepared slices]. To check for possible preparation dependent changes in viability of CA1 pyramidal neurons, both, cresyl violet stainings (Figures 9A,B) as well as visualization of the dendritic tree by Alexa 488 Fluor loading of CA1 neurons (Figures 9A1,B1) were performed in ACSF and sucrose prepared slices. The number of cell layers in CA1 (ACSF: 4.6 ± 0.2 vs. Sucrose: 4.7 ± 0.2, p > 0.05) and the total length of the apical dendrites (ACSF: 1734.2 ± 148.2 μm vs. Sucrose: 1921.3 ± 243.3 μm, p > 0.05) was similar in both groups (Figures 9C,F). Overall, the results of the cresyl violet stainings for both groups were comparable to typical respective stainings of hippocampal slices (Rice et al., 1994; Aitken et al., 1995). Nevertheless, the thickness of the pyramidal cell layer in CA1 (ACSF: 128.5 ± 6.4 μm vs. Sucrose: 152.7 ± 4.5 μm, p < 0.05, two-tailed Student’s t-test) and the soma size of CA1 pyramidal cells (ACSF: 32 ± 1.2 μm vs. Sucrose: 28.7 ± 1.1 μm, p < 0.05, two-tailed Student’s t-test) was increased in sucrose prepared slices (Figures 9D,E). These latter two findings might result from reduced stiffness of the perineuronal net in sucrose prepared slices (compare Morales et al., 2004), allowing somata, and thus cell layers, to increase in size. Overall, our histological data do not reveal any morphological changes which could obviously account for the observed STDP deficit after sucrose preparation. Figure 9. Similar morphological properties of CA1 pyramidal neurons in both types of preparation. Hippocampal slices were prepared according to the two described procedures [(A): ACSF, (B): sucrose] and subsequently processed for cresyl violet staining. Higher magnifications (20×) are shown in the middle panels. No obvious differences in the quality of slices are visible. Reconstructions of the apical dendrites of CA1 pyramidal cells with Alexa 488 Fluor are shown in (A1) for ACSF preparation and (B1) for sucrose prepared slices. No gross differences in dendritic length or branching are visible. Data are quantified in the lower panels: (C) Number of cell layers in stratum pyramidale in ACSF (black) and sucrose prepared slices (white bar) are similar (p > 0.05). Sucrose preparation leads to an increase in thickness of stratum pyramidale (D) and an increased soma size of individual pyramidal cells (for explanation see text) compared to ACSF preparation [(E), p < 0.05]. (F) Total dendritic length of the apical dendrites is comparable for slices of both preparation groups. In conclusion, several lines of evidence suggest that endogenous dopamine regulates both, spiking behavior and the efficiency to induce t-LTP, and that sucrose preparation – by decreasing endogenous dopamine levels – interferes with the efficiency to induce STDP in CA1 of rat hippocampus. Using whole cell recordings of CA1 pyramidal neurons in acute hippocampal slices from juvenile rats, we show that with a given STDP paradigm the resulting change in plasticity is critically dependent on conditions during slice preparation. We demonstrate that preparation of hippocampal slices in sucrose containing media reduces dopamine levels and leads to slower action potential rise times and increased AP latencies, which correlates with a reduced efficiency to elicit STDP. t-LTP and action potential properties of sucrose slices could be rescued completely by brief incubation with dopamine (but not isoproterenol), whereas reduction of endogenous dopamine signaling via D1 receptors in ACSF slices inhibited t-LTP. These results suggest that dopamine regulates the efficiency of STDP induction in hippocampal CA1 area. Previous studies of STDP in the hippocampus revealed a large diversity of successful induction protocols and deduced learning rules (e.g., Magee and Johnston, 1997; Pike et al., 1999; Nishiyama et al., 2000, for review see Buchanan and Mellor, 2010). One might argue that species and age differences could account for these distinctions in successful STDP induction protocols. 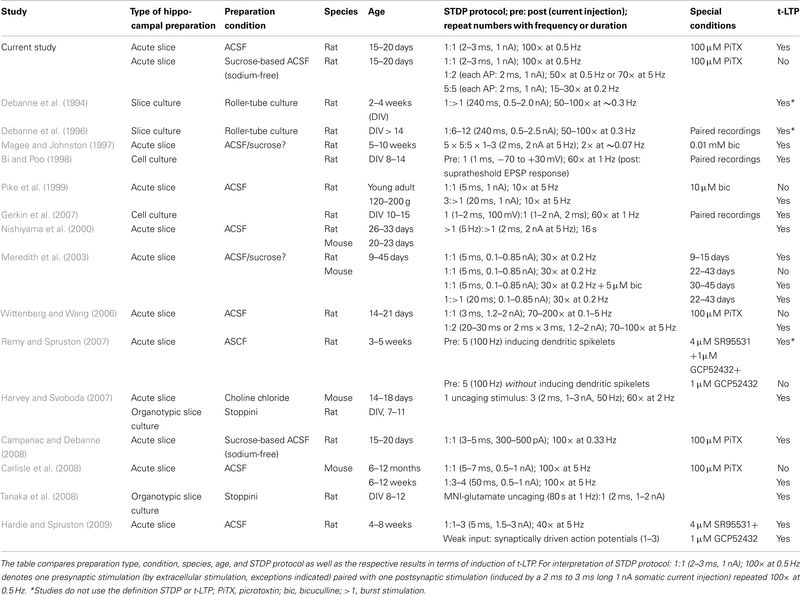 However, even with a given species and age, and employing a similar STDP protocol, different learning rules have been described (compare Wittenberg and Wang, 2006; Campanac and Debanne, 2008, see Table 3). According to our data, some of these rather contrasting findings could originate at least in part from subtle differences in experimental conditions, which could lead, e.g., to depletion of STDP modulators like dopamine. Table 3. Comparison of experimental conditions for hippocampal STDP between our own study and previously published experiments. Sucrose-based preparation media are widely accepted as slice preparation solutions for electrophysiological recordings, including measurements of synaptic plasticity (see, e.g., Campanac and Debanne, 2008; Pawlak and Kerr, 2008). In our experiments, slice preparation in sucrose media inhibited STDP (compare Figures 1 and 2), which could not be rescued by stronger synaptic activation with pre- or postsynaptic train stimulation or by postsynaptic spike doublets (see Figure 4). Thus, neither enhanced glutamate release nor strengthened postsynaptic depolarization during STDP induction could compensate for the lack of STDP. Our results suggest that the deficit in synaptic plasticity after sucrose preparation is more pronounced when using STDP protocols, because theta-burst induced LTP in field potential recordings was still observed, although the resulting LTP was decreased in amplitude compared to ACSF slices (see Figure 3). Interestingly, both experimental groups showed similar levels of short-term plasticity (i.e., 1–20 min after theta-burst stimulation). In the light of the reduced endogenous DA levels in our sucrose prepared slices, it seems reasonable to suggest that the reduced e-LTP in these slices results from decreased DA signaling. A similar decrease in e-LTP after application of the D1 antagonist SCH23390 has been shown previously in CA1 (Otmakhova and Lisman, 1996). The STDP deficit after sucrose preparation was not an acute effect, since brief incubation of slices with sucrose containing solution (195 mM, 20 mM Na+) for up to 10 min, and subsequent recovery in our standard extracellular ACSF, did not yield comparable changes in STDP and AP properties, as observed in sucrose prepared slices (data not shown). Possible explanations for the STDP deficit could be washout of important plasticity relevant factors by incubation with the sucrose containing solutions during preparation. In this respect, besides dopamine, BDNF and adrenaline have also been proven to be important factors for induction of LTP in CA1 (Korte et al., 1995; Otmakhova and Lisman, 1996; Patterson et al., 1996; Kang et al., 1997; Kauer and Malenka, 2007; Seol et al., 2007; Gottmann et al., 2009; Scott and Aperia, 2009). To clarify the contribution of some of these plasticity relevant factors to the sucrose-induced STDP deficit, further experiments were performed (see below). We used modified sucrose media (Budde et al., 2005) with lower concentration of sucrose, and without any sodium chloride for slice preparation, and also conventional ACSF preparation solution, for our STDP experiments. To explore changes in viability of slices due to preparation conditions, histological analyses of somata and apical dendrites of single CA1 pyramidal neurons were performed (see Figure 9). However, no gross morphological differences in cresyl violet stained hippocampal slices between sucrose and ACSF conditions were evident, and both groups revealed hippocampal morphology as described previously (Rice et al., 1994; Aitken et al., 1995). Sucrose-based ACSF preparation is thought to support viability of neurons during preparation, and to improve accessibility of cells for patch clamp recordings. Furthermore sucrose-based media can be used for weakening of perineuronal nets in brain slice preparations (Morales et al., 2004). The resulting reduced tension by the partially destroyed neuronal nets might account for the increases in soma size of individual CA1 pyramidal neurons and in pyramidal layer thickness, whereas cell numbers remained unchanged. Also the similar total apical dendritic length of CA1 pyramidal neurons in both groups speaks against a relevant change in postsynaptic cell properties following sucrose preparation (see Figure 9F). Good viability of neurons in our sucrose prepared slices is also evident from the measured intrinsic electrophysiological properties (see Table 1: ACSF vs. Sucrose). Although the RMP was slightly different between the two groups, all values are clearly in the expected range for CA1 pyramidal cells in patch clamp recordings (Spigelman et al., 1992; Spruston and Johnston, 1992; Staff et al., 2000). Furthermore, during experiments all cells were held at −70 mV in the current clamp mode, such that the slightly different RMPs prior to the start of the recording, cannot directly account for the observed sucrose-dependent STDP deficit. Other electrophysiological and synaptic properties (see Tables 1 and 2, compare ACSF vs. Sucrose) were identical in the two groups, and efficient repetitive spike firing could be observed also in the sucrose group. Overall, the observed cell properties of CA1 neurons in our sucrose prepared slices cannot easily be reconciled with an unhealthy status of neurons under these conditions, which are also routinely used in many other studies investigating LTP. Furthermore, the differences we observe cannot directly explain the sucrose-dependent STDP deficit in our recordings. The action potential frequency in response to constant current injection was enhanced, whereas spike frequency adaptation was decreased in neurons from sucrose prepared slices (Figures 5A–D). Although other interpretations are possible, it is conceivable that higher excitability (e.g., higher AP frequency) could lead to facilitated LTP induction. In contrast, our results clearly show decreased rather than facilitated LTP under these conditions (Figure 2), making such a direct connection between excitability and t-LTP induction rather unlikely. Alternatively, it could be argued that increased firing rates in sucrose prepared neurons could lead to saturated EPSP amplitudes already prior to STDP stimulation. This interpretation is not supported by our data, since we found similar maximal EPSPs, and used comparable synaptic output values (i.e., 30–50% of maximal EPSP amplitudes prior to STDP induction), both speaking in favor of comparable basal synaptic strength in the two experimental groups. Interestingly, spike rise times, either induced by long-lasting depolarization (see Figure 5E) or during STDP induction (see Figure 6E) were significantly slower in sucrose prepared neurons. Although fast rise times of APs (as seen in neurons after ASCF preparation) are generally accepted to be a good indicator for physiological intact and healthy neurons, other synaptic and action potential properties as well as histological parameters tested in our study do not favor the interpretation that cells in sucrose prepared slices were not in good condition (see Tables 1 and 2; Figure 9). Given the importance of spike timing in STDP, it is tempting to speculate, however, that the more slowly (by a factor of 1.5–3) rising action potentials in the sucrose group can somehow interfere with the ability of backpropagating action potentials to sufficiently depolarize postsynaptic structures just in time with the incoming EPSP. However, since dopamine and isoproterenol both shortened rise times, but only dopamine restored STDP (see below), spike rise times in sucrose prepared slices do not seem to affect STDP induction. Our results also revealed a significantly longer latency for induction of the first action potential in neurons of the ACSF group (Figure 5F). As shown by Spruston et al. (1995) latency to spike peak increases with distance from soma, and differences in the shape of dendritic action potentials are of tremendous importance in deciding whether t-LTP or t-LTD can be observed (Dan and Poo, 2006; Remy and Spruston, 2007). If the AP latency was critical for t-LTP induction in our recordings, the shorter latency of APs in sucrose should have shifted the optimal time window for t-LTP to more positive values, which we did not observe. Thus, in spite of the observed strong correlation, the shortened AP latency cannot directly explain the STDP deficit in sucrose prepared slices. However, our observation that, both, spike latency and STDP are rescued by exogenous DA within 10–20 min., while isoproterenol fails to rescue either of these effects (see below), leads us to suggest that DA (most likely via regulation of K+ channels in dendrites) regulates the efficiency of STDP induction in CA1. Alternatively or synergistically, biochemical signaling cascades downstream of D1 receptors, possibly affecting the balance of cAMP dependent phosphatase/kinase signaling, which can affect AMPA receptor trafficking (see, e.g., Gao et al., 2006) or backpropagation of dendritic spikes (Hoffman and Johnston, 1999; Hamilton et al., 2010) might account for D1 dependent restoration of t-LTP in our experiments. Interestingly, PKA dependent endocytosis of synaptic SK2 channels (Lin et al., 2010) can regulate, both, the efficiency of LTP induction and firing patterns in the postsynaptic neuron (Faber, 2009). Similar to our observation of parallel modulation of spike properties and t-LTP efficiency, these data indicate that cAMP dependent regulation of action potential properties and efficiency of LTP induction can occur in parallel, although both processes are not necessarily causally connected. Dopamine and noradrenaline seem to be essential neuromodulators for STDP in different brain regions (reviewed in Pawlak et al., 2010). Therefore, in an attempt to rescue the STDP deficit in sucrose prepared slices, we focused our experiments on dopamine and noradrenaline. Our data show that short-term incubation (10–20 min) with 20 μM dopamine, a concentration that is commonly used for in vitro studies and is comparable to the effective in vivo concentration for dopamine (Zhang et al., 2009), reinstates the induction of t-LTP in sucrose prepared slices, whereas inhibition of signaling of endogenous dopamine via D1 receptors inhibits t-LTP in ACSF slices (Figures 6 and 8). This is to our knowledge the first description of dependence of STDP in hippocampal CA1 pyramidal neurons in brain slices, on endogenous dopamine signaling. Of note, an additional involvement of the D1 like antagonist SCH23390 that we used, in inhibition of G-Protein coupled inwardly rectifying potassium channels has been reported (e.g., Kuzhikandathil and Oxford, 2002). However, this effect was not evident from our experiments, since membrane potential and action potential frequency remained unchanged in SCH23390. Recent studies suggested that STDP can be regulated by different neuromodulatory transmitter systems in other preparations: STDP in slices from visual cortex has been shown to depend on exogenous application of acetylcholine (acting via M1 receptors) and noradrenaline (via β-adrenergic receptors), respectively (Seol et al., 2007). STDP in the prefrontal cortex is favored by activation of nAChRs (Couey et al., 2007). Similarly, exogenous dopamine acting via D1 receptors has been suggested to be a modulating factor for induction of STDP in dissociated cultures of hippocampal neurons (Zhang et al., 2009), and application of noradrenaline has been shown to regulate conditions for induction of t-LTP in CA1 of hippocampal slices (Lin et al., 2003). Only in slices from striatum, endogenous dopamine acting mainly via D1 receptors has been shown previously to be a limiting factor for eliciting t-LTP (Pawlak and Kerr, 2008; Shen et al., 2008). Since all the above mentioned studies (including our own) were performed in the presence of inhibitors of GABAergic synaptic transmission, the modulating action of dopamine can in all cases not be attributed to altered synaptic inhibition (thereby favoring conditions for the induction of STDP), as has been described previously for dopamine dependent modulation of STDP in amygdalar neurons (Bissiere et al., 2003). To evaluate the specificity of dopamine for successful induction of STDP and the concomitant modulation of AP parameters, we also tested the effects of noradrenergic activation by stimulation with the β-adrenergic agonist isoproterenol (see Figure 6). In contrast to Lin et al. (2003), we did not observe a restoring or facilitating effect of isoproterenol on STDP in neurons of sucrose prepared hippocampal slices (see Figures 6B–D). This might be explained by the different starting conditions in their experiments: while Lin et al. (2003) tried to extent the effective time window for STDP induction by application of isoproterenol (spike timings 20 < Δt < 40 ms) under conditions of functional STDP, we reasoned that isoproterenol might facilitate STDP (spike timing Δt ≤ 10 ms) in our sucrose-induced STDP deficit situation. Together these results suggest that the efficiency of isoproterenol to regulate STDP is critically dependent on basal conditions for synaptic plasticity. Seol et al. (2007) described an effect of β-adrenergic agonists (e.g., isoproterenol) on STDP in slices from visual cortex, which was – similar to our own results with DA – essential for functional STDP. Since we did not observe this effect for acute hippocampal slices, further experiments are necessary to clarify if isoproterenol effects on STDP differ between brain regions, as suggested previously (Swanson-Park et al., 1999). Modifications in the ability of a given stimulus to induce synaptic plasticity (so-called metaplasticity; including conversion of a LTP stimulus to elicit LTD, and vice versa), as observed in our study, are dependent on numerous changes affecting neurotransmitter signaling and neuronal excitability (for recent reviews see, e.g., Turrigiano and Nelson, 2004; Abraham, 2008). A-type as well as Ca2+ activated K+ channels, and hyperpolarization induced cation channels (Ih) are considered as potential targets mediating such changes in intrinsic excitability. Future experiments should elucidate whether the sucrose/dopamine effect observed in our study can be attributed to changed properties of these conductances (compare below). A metaplasticity change leading to inhibition of LTP can often be overcome by increasing the intensity of the LTP inducing stimulus. While stronger STDP induction protocols were not able to overcome our impaired t-LTP (compare Figure 4), theta-burst stimulation induced LTP of synaptic population responses could still be evoked after sucrose preparation (compare Figure 3). Although these findings are in general consistent with the concept of metaplasticity, future studies aiming at investigating LTD and LTP in responses to a wide time/frequency window of induction protocols will be required to determine, whether the sucrose-induced changes fulfill the concept of metaplasticity. Specifically, these studies will be needed to reveal whether sucrose-induced changes correspond to the unmasking of a second window for t-LTD (compare Nishiyama et al., 2000). Overall, although few studies have addressed the issue of neuromodulatory transmitters in STDP directly (for a recent review see Pawlak et al., 2010), their action on STDP is not surprising, given the well-known modulation of synaptic plasticity by these transmitters in different brain areas (Jay, 2003; Lisman and Grace, 2005; Hasselmo, 2006; Sara, 2009; Wickens, 2009). Similar to what we observed for rescue of t-LTP, also the action potential firing pattern of CA1 neurons in sucrose prepared slices was changed dramatically by acute application of exogenous dopamine. In contrast, isoproterenol only partially restored AP properties under these conditions (compare Figure 7; Table 2). Although this is just a correlation, it is well accepted that the shape of dendritically propagating action potentials is a critical determinant for the induction of STDP (see, e.g., Gulledge and Stuart, 2003; Waters et al., 2005; Sjostrom and Hausser, 2006; Froemke et al., 2010). Dopamine as well as direct stimulation of PKA acting downstream of D1/D5 and D2 receptors, respectively, have been described previously to regulate different types of voltage gated ion channels, leading to concomitant changes in action potential properties: for example Benardo and Prince (1982) observed dopamine dependent modulation of calcium activated K+ conductances yielding reduced firing rate and hyperpolarization of the RMP in hippocampal CA1 pyramidal neurons, which is in good agreement with the effects of dopamine on APs, as observed in our study. Decreased AP firing rates in hippocampal neurons by application of dopamine were also reported by others (Pockett, 1985). Hoffman and Johnston (1999) described increased AP amplitudes in dendrites of CA1 neurons in response to exogenous dopamine and other neuromodulators. These effects can be explained by actions of these neuromodulators on inactivation properties of voltage gated Na+ channels and modulation of A-type K+ channels (Johnston et al., 1999). In addition, a very recent report described a decrease of repetitive AP firing by dopamine dependent modulation of T-type Ca2+ channels in the axon initial segment (Bender et al., 2010). Given this multitude of effects of dopamine on these different types of voltage gated channels, it was beyond the scope of the present study to pinpoint the conductances responsible for dopamine regulation of APs in our cells. Nevertheless, analysis of frequency adaptation, rise times, and latencies of APs turned out to be a sensitive indicator of dopamine action on action potential firing in our neurons. Interestingly, while isoproterenol was able to restore spike rise times, it failed to be similarly effective as DA in changing adaptation and latencies of APs in sucrose prepared slices. Isoproterenol has been described previously to influence time course and amplitude specifically of dendritic APs (Hoffman and Johnston, 1999), and isoproterenol couples to the same stimulatory G-proteins, thus increasing cAMP, as dopamine (e.g., Swanson-Park et al., 1999). Our observation that isoproterenol shortened AP rise times to the same extent as DA, whereas spike latency (and spike adaptation) remained in the range of the sucrose condition, together with the fact that isoproterenol – unlike DA – was unable to restore STDP, suggests a correlation between modulation of ionic conductances regulating spike latency and spike adaptation and the efficiency to induce STDP. In spite of this correlation, our data do not allow to prove a causal connection between these AP parameters and STDP induction (see above). Although we measured AP properties with somatic recordings, it is likely that the dopamine dependent changes we observed for somatic APs lead qualitatively to similarly changed APs in the dendrites. Importantly, using dendritic recordings of backpropagating APs, previous studies have already shown that neuromodulatory transmitters, can increase the amplitude of backpropagating APs in dendrites of CA1 pyramidal neurons by altering dendritic conductances (compare Hoffman and Johnston, 1999). Given that altered AP parameters cannot directly account for our DA effects on t-LTP (compare above), future studies should reveal the exact role of DA in facilitating STDP in CA1 dendrites. In conclusion, hippocampal learning rules for a specific STDP paradigm are dependent on experimental conditions prior to and during recording. Subtle differences in preparation (e.g., sucrose preparation) can dramatically influence the outcome of STDP experiments. Several lines of evidence in our study suggest that specifically decreased dopamine signaling interferes with induction of t-LTP of rat hippocampal slices. This work was supported by grants from the DFG (SFB 779; LE 1020/2-1), and by the Schram Stiftung. We thank Sandra Maass for assistance with field potential recordings, Dr. Tanja Brigadski for performing the dopamine ELISA, and Dr. Thomas Munsch and Dr. Thomas Endres for helpful discussions. Abraham, W. C. (2008). Metaplasticity: tuning synapses and networks for plasticity. Nat. Rev. Neurosci. 9, 387. Aghajanian, G. K., and Rasmussen, K. (1989). Intracellular studies in the facial nucleus illustrating a simple new method for obtaining viable motoneurons in adult rat brain slices. Synapse 3, 331–338. Aitken, P. G., Breese, G. R., Dudek, F. F., Edwards, F., Espanol, M. T., Larkman, P. M., Lipton, P., Newman, G. C., Nowak, T. S. Jr., and Panizzon, K. L. (1995). Preparative methods for brain slices: a discussion. J. Neurosci. Methods 59, 139–149. Benardo, L. S., and Prince, D. A. (1982). Dopamine modulates a Ca2+-activated potassium conductance in mammalian hippocampal pyramidal cells. Nature 297, 76–79. Bender, K. J., Ford, C. P., and Trussell, L. O. (2010). 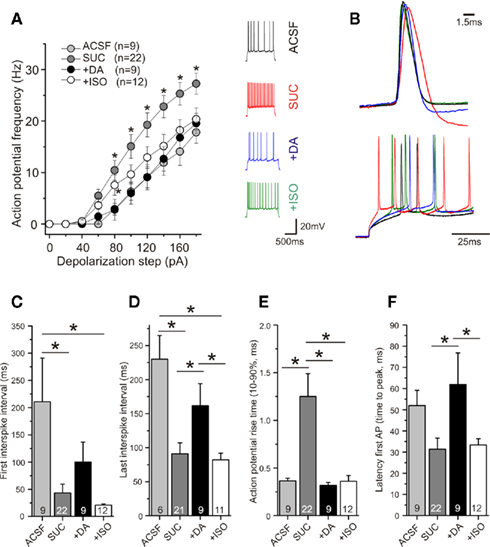 Dopaminergic modulation of axon initial segment calcium channels regulates action potential initiation. Neuron 68, 500–511. Bi, G. Q., and Poo, M. M. (2001). Synaptic modification by correlated activity: Hebb’s postulate revisited. Annu. Rev. Neurosci. 24, 139–166. Bissiere, S., Humeau, Y., and Luthi, A. (2003). Dopamine gates LTP induction in lateral amygdala by suppressing feedforward inhibition. Nat. Neurosci. 6, 587–592. Bliss, T. V., and Lomo, T. (1973). Long-lasting potentiation of synaptic transmission in the dentate area of the anaesthetized rabbit following stimulation of the perforant path. J. Physiol. (Lond.) 232, 331–356. Budde, T., Caputi, L., Kanyshkova, T., Staak, R., Abrahamczik, C., Munsch, T., and Pape, H. C. (2005). Impaired regulation of thalamic pacemaker channels through an imbalance of subunit expression in absence epilepsy. J. Neurosci. 25, 9871–9882. Campanac, E., and Debanne, D. (2008). Spike timing-dependent plasticity: a learning rule for dendritic integration in rat CA1 pyramidal neurons. J. Physiol. (Lond.) 586, 779–793. Carlisle, H. J., Fink, A. E., Grant, S. G., and O’Dell, T. J. (2008). Opposing effects of PSD-93 and PSD-95 on long-term potentiation and spike timing-dependent plasticity. J. Physiol. (Lond.) 586, 5885–5900. Couey, J. J., Meredith, R. M., Spijker, S., Poorthuis, R. B., Smit, A. B., Brussaard, A. B., and Mansvelder, H. D. (2007). Distributed network actions by nicotine increase the threshold for spike-timing-dependent plasticity in prefrontal cortex. Neuron 54, 73–87. Debanne, D., Gahwiler, B. H., and Thompson, S. M. (1994). Asynchronous pre- and postsynaptic activity induces associative long-term depression in area CA1 of the rat hippocampus in vitro. Proc. Natl. Acad. Sci. U.S.A. 91, 1148–1152. Debanne, D., Gahwiler, B. H., and Thompson, S. M. (1996). Cooperative interactions in the induction of long-term potentiation and depression of synaptic excitation between hippocampal CA3-CA1 cell pairs in vitro. Proc. Natl. Acad. Sci. U.S.A. 93, 11225–11230. Duguid, I., and Sjostrom, P. J. (2006). Novel presynaptic mechanisms for coincidence detection in synaptic plasticity. Curr. Opin. Neurobiol. 16, 312–322. Faber, E. S. (2009). Functions and modulation of neuronal SK channels. Cell Biochem. Biophys. 55, 127–139. Fink, A. E., and O’Dell, T. J. (2009). Short trains of theta frequency stimulation enhance CA1 pyramidal neuron excitability in the absence of synaptic potentiation. J. Neurosci. 29, 11203–11214. Froemke, R. C., Poo, M. M., and Dan, Y. (2005). Spike-timing-dependent synaptic plasticity depends on dendritic location. Nature 434, 221–225. Gao, C., Sun, X., and Wolf, M. E. (2006). Activation of D1 dopamine receptors increases surface expression of AMPA receptors and facilitates their synaptic incorporation in cultured hippocampal neurons. J. Neurochem. 98, 1664–1677. Gerkin, R. C., Lau, P. M., Nauen, D. W., Wang, Y. T., and Bi, G. Q. (2007). Modular competition driven by NMDA receptor subtypes in spike-timing-dependent plasticity. J. Neurophysiol. 97, 2851–2862. Gottmann, K., Mittmann, T., and Lessmann, V. (2009). BDNF signaling in the formation, maturation and plasticity of glutamatergic and GABAergic synapses. Exp. Brain Res. 199, 203–234. Gulledge, A. T., and Stuart, G. J. (2003). Action potential initiation and propagation in layer 5 pyramidal neurons of the rat prefrontal cortex: absence of dopamine modulation. J. Neurosci. 23, 11363–11372. Hamilton, T. J., Wheatley, B. M., Sinclair, D. B., Bachmann, M., Larkum, M. E., and Colmers, W. F. (2010). Dopamine modulates synaptic plasticity in dendrites of rat and human dentate granule cells. Proc. Natl. Acad. Sci. U.S.A. 107, 18185–18190. Hardie, J., and Spruston, N. (2009). Synaptic depolarization is more effective than back-propagating action potentials during induction of associative long-term potentiation in hippocampal pyramidal neurons. J. Neurosci. 29, 3233–3241. Hasselmo, M. E. (2006). The role of acetylcholine in learning and memory. Curr. Opin. Neurobiol. 16, 710–715. Hillman, K. L., Doze, V. A., and Porter, J. E. (2005). Functional characterization of the beta-adrenergic receptor subtypes expressed by CA1 pyramidal cells in the rat hippocampus. J. Pharmacol. Exp. Ther. 314, 561–567. Hoffman, D. A., and Johnston, D. (1999). Neuromodulation of dendritic action potentials. J. Neurophysiol. 81, 408–411. Johnston, D., Hoffman, D. A., Colbert, C. M., and Magee, J. C. (1999). Regulation of back-propagating action potentials in hippocampal neurons. Curr. Opin. Neurobiol. 9, 288–292. Kang, H., Welcher, A. A., Shelton, D., and Schuman, E. M. (1997). Neurotrophins and time: different roles for TrkB signaling in hippocampal long-term potentiation. Neuron 19, 653–664. Kasten, M. R., Fan, Y., and Schulz, P. E. (2007). Activation of silent synapses with sustained but not decremental long-term potentiation. Neurosci. Lett. 417, 84–89. Korte, M., Carroll, P., Wolf, E., Brem, G., Thoenen, H., and Bonhoeffer, T. (1995). Hippocampal long-term potentiation is impaired in mice lacking brain-derived neurotrophic factor. Proc. Natl. Acad. Sci. U.S.A. 92, 8856–8860. Kuenzi, F. M., Fitzjohn, S. M., Morton, R. A., Collingridge, G. L., and Seabrook, G. R. (2000). Reduced long-term potentiation in hippocampal slices prepared using sucrose-based artificial cerebrospinal fluid. J. Neurosci. Methods 100, 117–122. Kuzhikandathil, E. V., and Oxford, G. S. (2002). Classic D1 dopamine receptor antagonist R-(+)-7-chloro-8-hydroxy-3-methyl-1-phenyl-2,3,4,5-tetrahydro-1H-3-benzaze pine hydrochloride (SCH23390) directly inhibits G protein-coupled inwardly rectifying potassium channels. Mol. Pharmacol. 62, 119–126. Lin, M. T., Lujan, R., Watanabe, M., Frerking, M., Maylie, J., and Adelman, J. P. (2010). Coupled activity-dependent trafficking of synaptic SK2 channels and AMPA receptors. J. Neurosci. 30, 11726–11734. Lisman, J. E., and Grace, A. A. (2005). The hippocampal-VTA loop: controlling the entry of information into long-term memory. Neuron 46, 703–713. Lynch, G. S., Dunwiddie, T., and Gribkoff, V. (1977). Heterosynaptic depression: a postsynaptic correlate of long-term potentiation. Nature 266, 737–739. Markram, H., Lubke, J., Frotscher, M., and Sakmann, B. (1997). Regulation of synaptic efficacy by coincidence of postsynaptic APs and EPSPs. Science 275, 213–215. Morales, E., Fernandez, F. R., Sinclair, S., Molineux, M. L., Mehaffey, W. H., and Turner, R. W. (2004). Releasing the peri-neuronal net to patch-clamp neurons in adult CNS. Pflugers Arch. 448, 248–258. Munsch, T., and Pape, H. C. (1999). Modulation of the hyperpolarization-activated cation current of rat thalamic relay neurones by intracellular pH. J. Physiol. (Lond.) 519(Pt 2), 493–504. Nishiyama, M., Hong, K., Mikoshiba, K., Poo, M. M., and Kato, K. (2000). Calcium stores regulate the polarity and input specificity of synaptic modification. Nature 408, 584–588. Otmakhova, N. A., and Lisman, J. E. (1996). D1/D5 dopamine receptor activation increases the magnitude of early long-term potentiation at CA1 hippocampal synapses. J. Neurosci. 16, 7478–7486. Patterson, S. L., Abel, T., Deuel, T. A., Martin, K. C., Rose, J. C., and Kandel, E. R. (1996). Recombinant BDNF rescues deficits in basal synaptic transmission and hippocampal LTP in BDNF knockout mice. Neuron 16, 1137–1145. Pawlak, V., and Kerr, J. N. (2008). Dopamine receptor activation is required for corticostriatal spike-timing-dependent plasticity. J. Neurosci. 28, 2435–2446. Pike, F. G., Meredith, R. M., Olding, A. W., and Paulsen, O. (1999). Rapid report: postsynaptic bursting is essential for “Hebbian” induction of associative long-term potentiation at excitatory synapses in rat hippocampus. J. Physiol. (Lond.) 518(Pt 2), 571–576. Pockett, S. (1985). Dopamine changes the shape of action potentials in hippocampal pyramidal cells. Brain Res. 342, 386–390. Rice, M. E., Perez-Pinzon, M. A., and Lee, E. J. (1994). Ascorbic acid, but not glutathione, is taken up by brain slices and preserves cell morphology. J. Neurophysiol. 71, 1591–1596. Scheiderer, C. L., Smith, C. C., McCutchen, E., McCoy, P. A., Thacker, E. E., Kolasa, K., Dobrunz, L. E., and McMahon, L. L. (2008). Coactivation of M(1) muscarinic and alpha1 adrenergic receptors stimulates extracellular signal-regulated protein kinase and induces long-term depression at CA3-CA1 synapses in rat hippocampus. J. Neurosci. 28, 5350–5358. Scott, L., and Aperia, A. (2009). Interaction between N-methyl-D-aspartic acid receptors and D1 dopamine receptors: an important mechanism for brain plasticity. Neuroscience 158, 62–66. Segal, M. (1982). Norepinephrine modulates reactivity of hippocampal cells to chemical stimulation in vitro. Exp. Neurol. 77, 86–93. Sjostrom, P. J., and Hausser, M. (2006). A cooperative switch determines the sign of synaptic plasticity in distal dendrites of neocortical pyramidal neurons. Neuron 51, 227–238. Spigelman, I., Zhang, L., and Carlen, P. L. (1992). Patch-clamp study of postnatal development of CA1 neurons in rat hippocampal slices: membrane excitability and K+ currents. J. Neurophysiol. 68, 55–69. Spruston, N., and Johnston, D. (1992). Perforated patch-clamp analysis of the passive membrane properties of three classes of hippocampal neurons. J. Neurophysiol. 67, 508–529. Spruston, N., Schiller, Y., Stuart, G., and Sakmann, B. (1995). 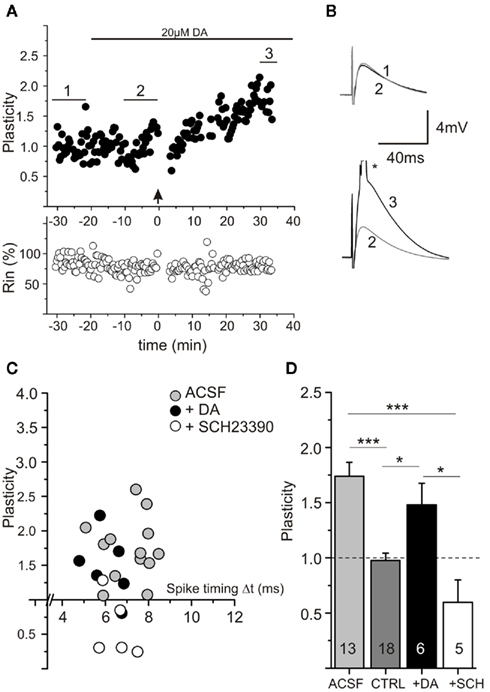 Activity-dependent action potential invasion and calcium influx into hippocampal CA1 dendrites. Science 268, 297–300. Staff, N. P., Jung, H. Y., Thiagarajan, T., Yao, M., and Spruston, N. (2000). Resting and active properties of pyramidal neurons in subiculum and CA1 of rat hippocampus. J. Neurophysiol. 84, 2398–2408. Swanson-Park, J. L., Coussens, C. M., Mason-Parker, S. E., Raymond, C. R., Hargreaves, E. L., Dragunow, M., Cohen, A. S., and Abraham, W. C. (1999). A double dissociation within the hippocampus of dopamine D1/D5 receptor and beta-adrenergic receptor contributions to the persistence of long-term potentiation. Neuroscience 92, 485–497. Tanaka, J., Horiike, Y., Matsuzaki, M., Miyazaki, T., Ellis-Davies, G. C., and Kasai, H. (2008). Protein synthesis and neurotrophin-dependent structural plasticity of single dendritic spines. Science 319, 1683–1687. Turrigiano, G. G., and Nelson, S. B. (2004). Homeostatic plasticity in the developing nervous system. Nat. Rev. Neurosci. 5, 97–107. Urban, N. N., Henze, D. A., and Barrionuevo, G. (1998). Amplification of perforant-path EPSPs in CA3 pyramidal cells by LVA calcium and sodium channels. J. Neurophysiol. 80, 1558–1561. Waters, J., Schaefer, A., and Sakmann, B. (2005). Backpropagating action potentials in neurones: measurement, mechanisms and potential functions. Prog. Biophys. Mol. Biol. 87, 145–170. Wickens, J. R. (2009). Synaptic plasticity in the basal ganglia. Behav. Brain Res. 199, 119–128. Wittenberg, G. M., and Wang, S. S. (2006). Malleability of spike-timing-dependent plasticity at the CA3-CA1 synapse. J. Neurosci. 26, 6610–6617. Yang, H. W., Lin, Y. W., Yen, C. D., and Min, M. Y. (2002). Change in bi-directional plasticity at CA1 synapses in hippocampal slices taken from 6-hydroxydopamine-treated rats: the role of endogenous norepinephrine. Eur. J. Neurosci. 16, 1117–1128. Zhang, J. C., Lau, P. M., and Bi, G. Q. (2009). Gain in sensitivity and loss in temporal contrast of STDP by dopaminergic modulation at hippocampal synapses. Proc. Natl. Acad. Sci. U.S.A. 106, 13028–13033. Published online: 03 November 2011. Copyright: © 2011 Edelmann and Lessmann. This is an open-access article subject to a non-exclusive license between the authors and Frontiers Media SA, which permits use, distribution and reproduction in other forums, provided the original authors and source are credited and other Frontiers conditions are complied with.